Nokia E6, which was up for pre-order 2 weeks ago, is finally available in India. The handset was launched along with the X7 yesterday. The company believes that the E6 will offer great functionality for business as well as regular users. The handset comes with the fancied Symbian Anna update, which is said to improve web browsing, and the user interface of the Symbian platform. The handset has been priced at Rs 18,679, which is slightly higher than the pre-order It will be available in Black, Silver and White colours from today in select Nokia stores. Nokia Indian is Marketing Director, Mr. Viral Oza, speaking on the occasion said With the launch of two new devices on the exciting new Symbian Anna, we aim to further consolidate our leadership position in the Indian smartphone market. With the Nokia E6 and the Nokia X7, and a robust line up of exciting new smart devices and user enhancements coming in the next few quarters, we are confident of further strengthening our smartphone user base. He also gave out info about the Symbian Anna update for other Symbian^3 handsets. 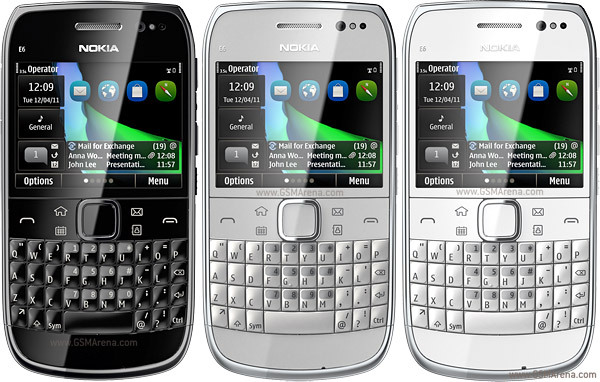 Handsets such as the Nokia N8, C7, C6-01, and the E7 will ship with the OS update from July onwards. As far as the existing handsets are concerned, the update will be rolled out from August, meaning that existing owners of the above handsets will have to wait for a month or more. Nokia is looking to consolidate its hold on the Indian cellphone market with the Nokia E6 and the X7, though we think it is too early to even think about that. People will certainly think twice before spending of their hard earned money on this smartphone. We would have really appreciated a bigger display on a phone of the E6 is calibre something like the BlackBerry Torch would have sufficed. E6 is available for but don it get your hopes up too high. The shipping is listed at taking 1-2 months, so the E6 won it be showing up at your doorstep soon.The key features include a 2.46-inch touch screen, qwerty keyboard and an 8 megapixel camera that is capable of capturing 720p video.Meanwhile, in India the Sony Ericsson is Xperia W8 is now available in India. The main marketing feature of the phone is it being Facebook friendly.The application for Facebook is designed so users can instantly communication on the popular social networking site.